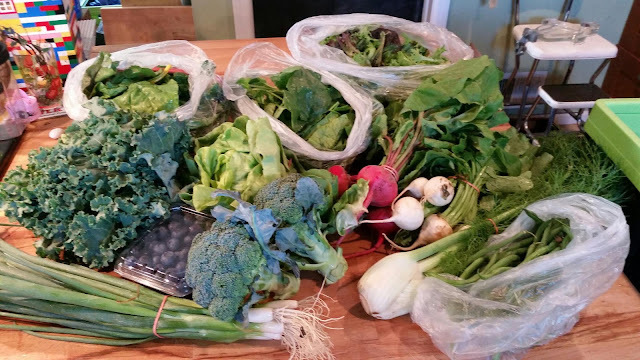 This week's Honey Brook Organic Farm CSA share included the lettuce mix, swiss chard, spinach, lettuce, kale, broccoli, beets, turnips, fennel, green beans, scallions and blueberries. I emailed them because I confused the beets for radishes. I'm an idiot. Next time, cut the thing open, try a piece and then, and only then, if you're still confused, email them. Yeesh. They were very nice about the whole thing. As usual, everything was super fresh and crisp. Those scallions...come on...they look amazing! Scallion pancakes, anyone? My bestie likes to slice up fennel and just eat them plain, which is great; but what do you do with the tops other than pesto? I'll have to do some research. It's like Christmas every week when you open the box. Sounds crazy, but I love it. No more strawberries. That season is officially over, but blueberry season has started! The birds eat all my blueberries and most of my raspberries, so it'll be nice to do the PYO and get them at the farm. The Premium Box has been the perfect size for us. I've been using up almost everything before our next week's pick up. I really haven't been pickling anything. No kimchi or radish greens....nothing. I've been trying to just cook what we've been getting. I've been adding a handful of spinach to our morning smoothies, baking up kale chips and trying a bunch of recipes from Food52 Mighty Salads, which for as simple as some of them seem...as well as some seeming to be quite the stretch to call it a salad...they've all been really good. The Chesterfield farm is starting their PYO blueberry picking this week, fingers crossed I'll get a notice from Pennington this week too!